Traverse the trip of a lifetime through the centre of the outback aboard The Ghan. Enjoy comprehensive touring of both Litchfield and Kakadu National Parks in the Top End. Cruise to and enjoy the colours and vibes of Singapore. 5 nights in Darwin at Doubletree by Hilton Esplanade including breakfast. 24 hour Hop-on Hop-off Darwin City Explorer Pass. Full day Litchfield National Park Waterfalls tour. Overnight Kakadu and East Alligator River tour. 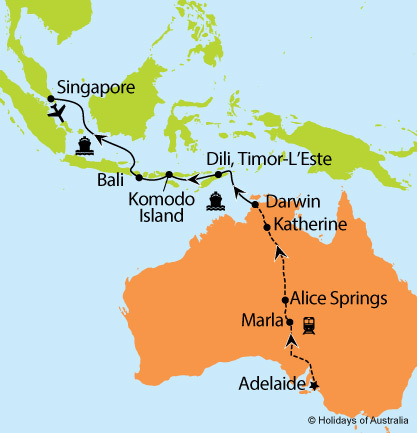 8 nights aboard Pacific Dawn cruising from Darwin to Singapore with port calls in Dili (Timor L’Este), Komodo Island (Indonesia) and Bali (Indonesia). Your cruise includes on board meals and entertainment. Transfer from the cruise terminal to your hotel. Includes a Singapore City Sights tour. 2 night stay in Singapore at the Rendezvous Hotel Singapore including breakfast. Transfer from your hotel to Changi Airport. One way economy flight from Singapore to your closest capital city. Images courtesy of Singapore Tourism, Tourism NT, & P&O Cruises. Departures from Hobart are subject to a supplement of $200 per person.